Background: Anemia of any degree contributes significantly to morbidity and mortality and has a significant effect on the quality of life of elderly women. Despite its clinical importance, anemia in the elderly women is underrecognized. Objectives: The objective of this study was to assess the magnitude and correlates of anemia in elderly women of a resettlement colony of Delhi. Materials and Methods: A community-based, cross-sectional study for the duration of 1 year was conducted among 512 geriatric women (≥60 years). Demographic characteristics, dietary assessment, and behavioral risk factors were determined by interview, and the participants underwent physical examination followed by hemoglobin estimation by HemoCue. Anemia was defined using the WHO criteria of hemoglobin <12 g/dl. Chi-square test was employed to study the association between sociodemographic factors and anemia followed by multivariate regression analysis. Results: The prevalence of anemia was 79.9% according to the WHO criteria of hemoglobin <12 g/dl in females. 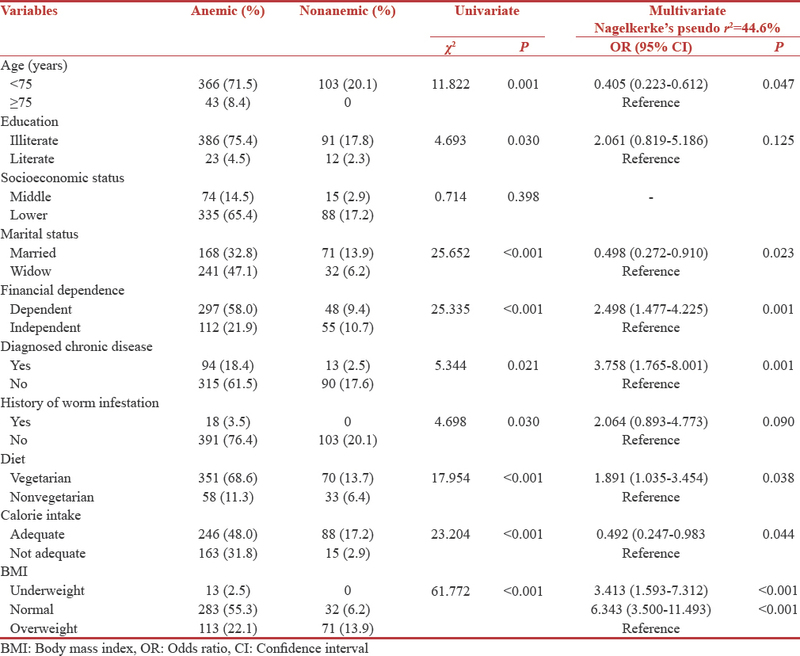 Age, education, marital status, financial dependence, diagnosed chronic disease, diet, calorie intake, history of worm infestation, and body mass index (BMI) were significantly associated with anemia on univariate analysis. In multivariate analysis, age, marital status, financial dependence, diagnosed chronic disease, diet, calorie intake, and BMI were significant explanatory variables for anemia. Conclusion: Our study points out high prevalence of and some of the major factors associated with anemia in elderly women. The need of the hour is to include our elderly women under the gamut of National Anemia Prophylaxis Program. Globally, elderly constitute around 11% of total population. The elderly population is likely to triple by 2050 and most of this increase is taking place in less-developed countries. The elderly in India constitute about 8.14% of the total population of the country according to the Census of India 2011. Women outnumber men in older age groups and this imbalance increases with age. Worldwide, there are some 123 women for every 100 men aged 60 and over. Considering the demographic, cultural, and income differences between genders, ageing means more challenges for women than for men. Many of the elderly women experience poor nutrition, reproductive ill health, dangerous working conditions, violence and lifestyle-related diseases, all of which exacerbate the postmenopausal phenomena and increase likelihood of disability and disorder including anemia. Anemia is a condition in which the number of red blood cells (RBCs), and consequently their oxygen-carrying capacity, is insufficient to meet the body's physiological needs. Anemia results from one or more of the following process: Defective red cell production, increased red cell destruction, or blood loss. The WHO Expert Group proposed that “anemia or deficiency should be considered to exist” when hemoglobin is <13 g/dl for men, <12 g/dl for nonpregnant women, and <11 g/dl for pregnant women. Anemia is a major public health problem affecting women across all age groups. Much emphasis has been paid on anemia in children and women of reproductive age group, but neglecting our elderly women. Despite the fact that, anemia in this population has a negative impact on the health and quality of life, possibly acting as a risk factor for the development, and aggravation of cardiovascular diseases and premature death, in addition to causing symptoms such as fatigue and reduced cognitive and functional capacity, anemia in the elderly women is underrecognized. The elderly population is increasing and there are scarce data on the epidemiology of anemia among the elderly women. These epidemiological data are necessary in planning interventions for controlling anemia in elderly population. The objective of this study was to assess the magnitude and correlates of anemia in elderly women of a resettlement colony of Delhi. This study obtained Ethical clearance from the Institutional Ethics Committee from Lady Hardinge Medical College (LHMC), New Delhi. Written informed consent was obtained from all the study participants and all participants requiring medical treatment were referred to our Urban Health Centre (UHC) where treatment was offered free of charge. The study was a community-based, cross-sectional study conducted in the Resettlement colony of Urban Delhi to assess the prevalence of anemia and its associated factors in elderly women. The study area is a Resettlement colony located in East Delhi at a distance of 11 km from Central Delhi, which is one of the field practice areas UHC of Department of Community Medicine, LHMC. The colony has a total estimated population of 26000 (according to the survey conducted by LHMC in 2010–2011) residing in 11 blocks, each having 1500–3500 population approximately. The study was carried out from November 2011 to March 2013. Data collection were done from January 2012 to December 2012. The study population comprised all elderly women aged 60 years and above residing in the Resettlement Colony for more than a year. According to the house-to-house survey conducted by the Department of Community Medicine, LHMC (2010–2011), number of elderly women in the area was approximately 1000. Using the prevalence of 52.5% in elderly ≥60 years  and precision of 10% the sample size was calculated to be 399. UHC area is made up of total 11 blocks. Out of that 6 blocks were selected by random sampling. All the elderly women in these 6 blocks were enrolled. Finally, 512 elderly women were enrolled in the study. They were interviewed using the pretested proforma after informed written consent. A semi-structured interview schedule was pretested. The information was collected and recorded on the pro forma, which was divided into two parts, the first part had sociodemographic details (age, religion, marital status, education, type of family, family income, socioeconomic status, financial dependence, and living arrangement) and the second part comprised history, dietary profile, clinical examination, and assessment of hemoglobin. Hemoglobin estimation by HemoCue was done for all elderly women. The HemoCue B-Hemoglobin system consists of disposable microcuvettes containing reagent in a dry form and a single purpose designed photometer. It utilizes the principle of oxidation of hemoglobin to hemiglobin by sodium nitrite and the subsequent conversion of hemiglobin to hemiglobinazide by sodium azide. A venous or capillary sample is introduced into the microcuvette by capillary action and after reaction with the reagents; the absorbance is read in the HemoCue photometer at 570 and 880 nm. The hemoglobin concentration is then displayed as a digital reading, in either g/dl or mmol/L in 15–45 s. The test was performed as stated by the manufacturer. Anemia was defined using the WHO criteria: Hemoglobin <12 g/dl in females. Grading of anemia was as follows. Severe anemia – hemoglobin <8 g/dl. Collected data were transformed into variables, coded, and entered into SPSS statistical software. The data were analyzed using SPSS version 12. For the purpose of calculating, Chi-square participants were categorized into anemic and nonanemic. P < 0.05 was considered statistically significant. Out of 512 elderly women enrolled in the study majority, that is, 80.3% were young-old (60–69 years) followed by old-old (70–79 years) 15.2% and oldest-old (≥80 years) 4.5%. The mean age of the population was found to be 64.61 ± 5.8 years and range of 60–92 years. Out of the total, 409 (79.9%) participants had anemia as per the WHO cutoff of hemoglobin <12 g/dl. This was graded into mild (38.1%), moderate (38.5%), and severe (3.3%) [Table 1]. The mean hemoglobin was 10.22 ± 1.28 g/dl with minimum hemoglobin of 7.70 g/dl and maximum of 13.20 g/dl. Chi-square test of independence was calculated to find association between anemia and various sociodemographic characteristics. The relation between anemia and age, education, marital status, financial dependence, diagnosed chronic disease, diet, calorie intake, history of worm infestation, and body mass index (BMI) was found to be significant (P< 0.05). On multivariate analysis, age, marital status, financial dependence, diagnosed chronic disease, diet, calorie intake, and BMI were associated with anemia. The odds were higher for >75 years age, widow, financially dependent, diagnosed chronic disease, vegetarian, inadequate calorie intake, and underweight elderly women [Table 2]. In our study, hemoglobin estimation was done by HemoCue method in 512 elderly women and the data analysis was done using the WHO criteria. From our study, anemia was found in more than two-third (79.9%) of the elderly women. Studies estimating the prevalence of anemia among elderly in our country are lacking, this result was in accordance with other studies ,,,, which showed a range of 52.5%–97.1%. Anemia in the elderly may be multifactorial in etiology as nutritional, physiological, and pathological problems. There is higher prevalence of anemia among women in the reproductive age group related to multiple pregnancies, nutritional imbalance, menstruation, and other gynecological problems. This anemia continued to exist in elderly women, in the absence of any proper corrective continuous measures, which was also found in our elderly women. Our study found that the prevalence of anemia increased significantly with increasing age (P = 0.047), this agree with the results of Kamel et al. and Mugisha et al. that showed that prevalence of anemia significantly increased with increasing age. The senescence is marked by reduced hemoglobin levels; however, anemia should not be considered a natural consequence of the physiology of aging. The most common causes of anemia in the elderly population are nutritional deficiencies, anemia of chronic diseases, and unexplained anemia. The current study shows that there is no statistically significant difference in frequency of anemia among participants as regard their education status and socioeconomic status. This was similar to findings of Kamel et al. This may be due to the fact that majority of the participants in our study were illiterate and belonged to low socioeconomic status and we had little representation from other educational and socioeconomic classes. It was seen that widows and financially dependent elderly women had higher prevalence of anemia in our study. As most women outlive their male counterparts, they are more likely to be having deteriorating health and mental stress. There are several situations that women face in their young age which have implications in their old age. Malnourishment in girls, low educational standards, limited job opportunities - all these make them dependent both in their active life and in old age. Their status within the family continues to be dependent on their husband and they sometimes have little or no say in the aspect of financial saving for old age. The loss of status at the death of their husband only increases the situation of dependency in old age. This financial dependency can become more complex as the woman grows older, given the situation that she has no source of income or right to property as seen in traditional families, leading to poor health-seeking behavior in widows. Our study found a significant association between anemia and chronic diseases. For chronic diseases, we have considered chronic diseases which were either diagnosed during the study by history and examination or patients were already on medication and had previous prescriptions available. We have clubbed together diabetes, chronic obstructive pulmonary diseases, chronic renal impairment, cancers, and cardiovascular diseases (CVD) which included hypertension, coronary artery disease, and cardiac failure for the purpose of the study. We have also tried to find association between anemia and history of worm infestation. Majority of elderly women in our study did not give history of any worm infestation. This could be due to memory impairment or embarrassment. The presence of diabetes and cancer remained significantly associated with anemia in a study done by Corona et al. Diabetes is one of the main causes of chronic renal insufficiency. Even at subclinical stages, diabetes is responsible for a considerable portion of cases of anemia in older adults due to reduction of Erythropoietin (EPO) secretion., Anemia has been associated with a higher incidence of cardiovascular disease. Cancer is an important risk factor for anemia, particularly when it affects the digestive system, because it causes intermittent bleeding (generally unnoticeable), which leads to anemia. Another mechanism is the decreased response to EPO, mainly during chemotherapy. Nutritional status has a significant influence on hemoglobin levels. The manifestation of anemia in older populations is associated with dietary inadequacy of micronutrients such as iron, folate, and Vitamin B12; blood loss; genetics; alterations in the bioavailability of micronutrients due to disease or medication use; renal insufficiency; and other less common causes., In our study, more than 80% of elderly women were vegetarians but they were not taking green leafy vegetables or fruits regularly, and this was significantly associated with lower hemoglobin levels. A study done by Tussing-Humphreys and Braunschweig, on anemia in postmenopausal women, assessment of diet using a Food Frequency Questionnaire correctly ranked participants with inadequate dietary intake for anemia-related nutrients to low hemoglobin status. Anemic elderly women had lower anthropometric status (BMI) in our study and this was significant. Similar findings were observed by Kim and Lee. Precise assessment of anemia in older individuals through use of hematologic parameters, clinical indicators of inflammation, as well as diet, will allow us to appropriately classify the type of anemia and recommend appropriate treatment options. To the best of our knowledge, this is the first study to estimate the prevalence of anemia among elderly women of a resettlement colony of Delhi with an adequate sample size. Furthermore, a blood sample was drawn from all the study participants and hemoglobin estimation was done using HemoCue. We have used dietary assessment, anthropometric measurements, and detailed history and examination to find association between anemia and sociodemographic factors. Our study has few limitations, first, the study has been carried out only in elderly women, second, some further investigations might be needed to know the type of anemia, and we have not investigated for other biological markers that could be important in determining the causes of anemia. Further studies need to be planned to effectively address the problem of anemia in elderly. Because the elderly population is expected to reach unprecedented levels in the coming years, anemia represents an emerging global health problem negatively impacting the quality of life in a significant proportion of the elderly women and represents a challenge and a burden for the individual, the community and the health-care providers. Its correction may play an important role in improving the quality of life of this population. The need of the hour is to include our elderly women under the gamut of National Anemia Prophylaxis Program. Report on World Population Ageing 2009; Economic and Social Affairs; United Nations Department of Economic and Social Affairs/Population Division; 2009. Available from: http://www.un.org/esa/population/publications/WPA2009/WPA2009_WorkingPaper.pdf. [Last accessed on 2016 Aug 28]. Ministry of Health & Family Welfare, Government of India. National Programme for the Health Care of Elderly. Operational Guidelines 2011-2012, Ministry of Health and Family Welfare, Government of India, New Delhi; 2011. World Health Report 2006. Working Together for Health. Statistical Annex. Geneva, World Health Organization; 2006. Blanc B, Finch CA, Hallberg L, Lawkowicz W, Layrisse M, Mollin DL, et al. Nutritional Anaemias. Report of a WHO Scientific Group. World Health Organization, Technical Report Series. Geneva: World Health Organization; 1968. p. 40. Onem Y, Terekeci H, Kucukardali Y, Sahan B, Solmazgül E, Senol MG, et al. Albumin, hemoglobin, body mass index, cognitive and functional performance in elderly persons living in nursing homes. Arch Gerontol Geriatr 2010;50:56-9. Purty AJ, Bazroy J, Kar M, Vasudevan K, Veliath A, Panda P. Morbidity pattern among the elderly population in the rural area of Tamil Nadu, India. Turk J Med Sci 2006;36:45-50. Nutritional Anaemias. Report of a WHO Scientific Group. Geneva, World Health Organization; 1968. (WHO Technical Report Series, No. 405). Available from: http://ww.whqlibdoc.who.int/trs/WHO_TRS_405.pdf. [Last accessed on 2017 Feb 04]. Agrawal S, Deo J, Verma AK, Kotwal A. Geriatric health: Need to make it an essential element of primary health care. Indian J Public Health 2011;55:25-9. Joshi K, Kumar R, Avasthi A. Morbidity profile and its relationship with disability and psycho-social distress among elderly people in Northern India. Int J Epidemiol 2003;32:978-87. Swami HM, Bhatia V, Dutt R, Bhatia SPS. A community based study of the morbidity profile among the elderly in Chandigarh, India. Bahrain Med Bull 2002;24:13-6. Sharma MK, Swami HM, Gulati R, Bhatia V, Kumar D. Life style and morbidity profile of geriatric population in urban area of Chandigarh. J Indian Acad Geriatr 2005;3:122-5. Kamel M, Ebeid S, Elakkad R, Shafeek N. Prevalence of Anemia among Community Dwelling Elderly in Dakahlia as a Representative of Rural Areas in Egypt and Its Impact on Their Functional Status. Advances in Aging Research 2015:4:168-176. Doi: 10.4236/aar.2015.45018. Mugisha JO, Baisley K, Asiki G, Seeley J, Kuper H. Prevalence, types, risk factors and clinical correlates of anaemia in older people in a rural Ugandan population. PLoS One 2013;8:e78394. Balducci L, Ershler WB, Krantz S. Anemia in the elderly-clinical findings and impact on health. Crit Rev Oncol Hematol 2006;58:156-65. Andrès E, Federici L, Serraj K, Kaltenbach G. Update of nutrient-deficiency anemia in elderly patients. Eur J Intern Med 2008;19:488-93. World Health Report. Working Together for Health. Statistical Annex. Geneva: World Health Organization; 2006. Corona LP, Duarte YA, Lebrão ML. Prevalence of anemia and associated factors in older adults: Evidence from the SABE study. Rev Saude Publica 2014;48:723-431. El-Achkar TM, Ohmit SE, McCullough PA, Crook ED, Brown WW, Grimm R, et al. Higher prevalence of anemia with diabetes mellitus in moderate kidney insufficiency: The kidney early evaluation program. Kidney Int 2005;67:1483-8. Culleton BF, Manns BJ, Zhang J, Tonelli M, Klarenbach S, Hemmelgarn BR, et al. Impact of anemia on hospitalization and mortality in older adults. Blood 2006;107:3841-6. Miller CB, Jones RJ, Piantadosi S, Abeloff MD, Spivak JL. Decreased erythropoietin response in patients with the anemia of cancer. N Engl J Med 1990;322:1689-92. Guralnik JM, Ershler WB, Schrier SL, Picozzi VJ. Anemia in the elderly: A public health crisis in hematology. Hematology Am Soc Hematol Educ Program 2005;1:528-32. Olivares M, Hertrampf E, Capurro MT, Wegner D. Prevalence of anemia in elderly subjects living at home: Role of micronutrient deficiency and inflammation. Eur J Clin Nutr 2000;54:834-9. Tussing-Humphreys L, Braunschweig C. Anemia in postmenopausal women: Dietary inadequacy or nondietary factors? J Am Diet Assoc 2011;111:528-31. Kim HS, Lee BK. Cross-sectional study on the prevalence of anemia among rural elderly in Asan. Nutr Res Pract 2008;2:8-12.